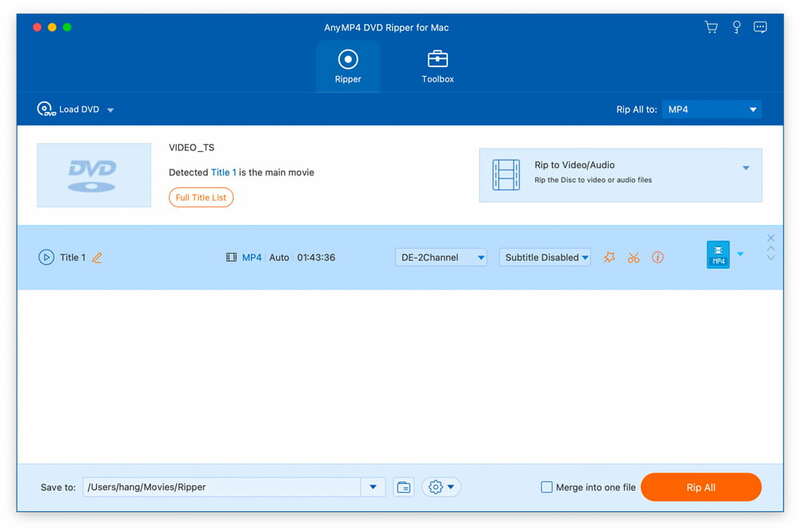 AnyMP4 DVD Ripper for Mac not only help you rip DVD movies to any video formats like MP4, MOV, M4V, AVI, WMV, FLV, MKV, MPEG and more for Mac, but also rip DVD to other audio formats such as MP3, FLAC, WAV, WMA, AAC, ALAC, AC3 and more for Mac. Meanwhile, with its powerful editing functions, you can make your videos unique. Thus, you can enjoy these videos and audios on iPhoneSE, iPhone 6s/6s plus, iPad Air, iPad mini 4/3/2, iPod Nano 7, Galaxy S7 and so on. This Mac DVD Ripper can rip DVD to any video formats such as MP4, MOV, AVI, WMV, FLV, MKV and more. Thus, you can easily enjoy DVD disc on your iPhoneSE, iPhone 6s/6s plus, iPad 4, iPad Air, iPod touch, iPod nano, Samsung Galaxy series, Google Nexus, HTC and so on. This DVD Ripper Mac software can convert DVD disc to 1080p HD video like TS, HD MP4, HD AVI, HD MOV, HD ASF, HD H.264/MPEG-4 AVC and more on Mac. So you can also get a perfect image effect after ripping your DVD. Mac DVD Ripper enables you to extract audio files from DVD and convert them to MP3, AAC, AC3, WAV and more. Therefore, the devices you can enjoy your DVD no longer limited in the DVD drive. AnyMP4 Mac DVD Rip allows you to adjust the video effect by setting the parameters like Brightness, Saturation, Contrast, Hue and Volume. In addition, you can change the profile settings like Video Bitrates, Resolution, Frame Rate, Channels and so on. At the same time, you can also trim any part of the video to your needed length, merge video clips together into one, crop the video frame and add text or image watermark. AnyMP4 DVD Ripper for Mac is easy to master its key functions. You never worry that you do not know how to use it. Besides, you can try this software before you buy it.